The Revolabs Single Executive HD Wearable Wireless Microphone System Kit from B&H includes a Revolabs Executive HD Wearable Microphone, a base station, and a charging base. 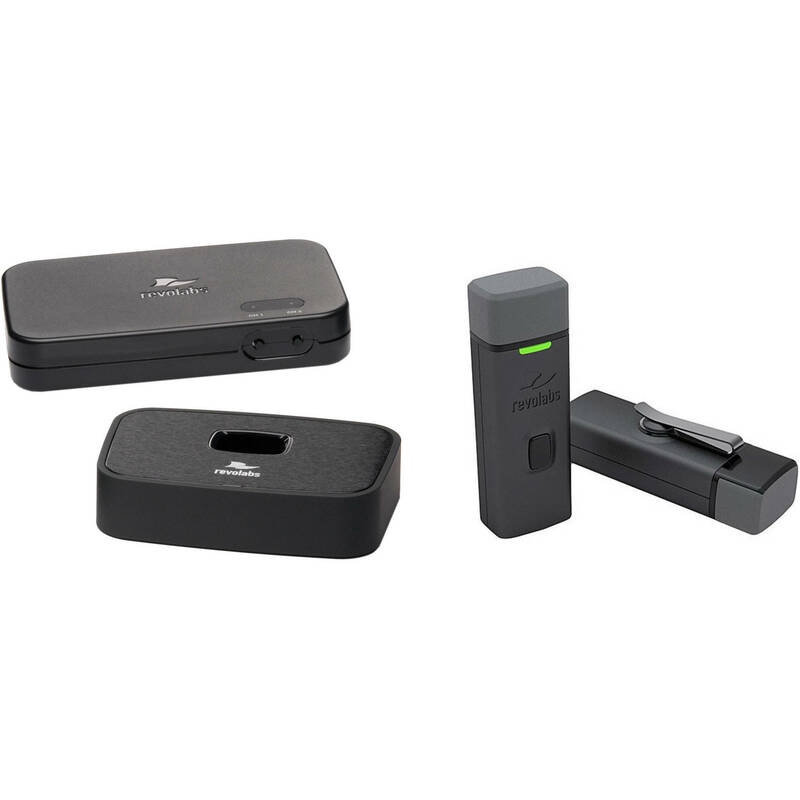 Its small size allows for easy and non-intrusive integration for audio solutions that require a limited number of wireless microphones and will amplify your voice, record lectures, and facilitate video conferencing in your limited space. The portable plug-and-play design, simple setup, and HD sound quality make this kit a suitable option for a wide range of applications. The Revolabs HD Single-Channel Wireless Microphone System is an efficient audio solution for video conferencing or voice reinforcement applications. Its small size allows for an easy and non-intrusive integration for audio solutions that require a limited number of wireless microphones. This single-channel system supports 1 HD audio wireless microphone (sold separately). The HD Single-Channel System utilizes Revolabs' Designed For Speech technology. This technology provides wideband frequency which improves the intelligibility and presence of speech, allowing the system to pick up the entire human voice spectrum. The technology consists of proprietary audio processing algorithms resulting in the accurate reproduction of human speech. As with the other HD systems, this single-channel system provides bi-directional audio, which allows audio to be sent back to the microphone so that you can listen using a headset. The HD Single-Channel Wireless Microphone System is managed through a series of dip switches allowing you to control the different audio options. The switches also allow you to select the level of the outputs, line level, or microphone level. Additional settings let you control the transmission power mode used by the receiver, providing a high density of HD systems in a given area where a lot of systems are required. The adjustable power reduces interferences between the systems. Finally, the dip switches allow you to activate filters and equalizers to further improve the audio transmitted by the microphones. This HD single-channel wireless system can be mixed and matched with a variety of HD wireless microphones (sold separately). Offered separately, the microphones are sleek in design and come in several styles: wearable, tabletop directional, tabletop omni-directional, XLR adapter for handheld microphones, and adapters for Countryman microphones. Revolabs microphones and adapters are easy to use. You can just remove the microphone from the charger base, un-mute, and talk. The HD Single-Channel Wireless System consists of a base station and an HD wireless microphone charger base. Additional benefits include a rechargeable battery providing up to 8 hours of talk time on a full charge. It takes approximately 2 hours to fully charge a battery. Also, as the system is wireless, enterprise users can move about their conference room and still be heard. The Revolabs Executive HD Wearable Microphone features a rotatable clip for mounting on clothing, shirt lapels, pockets, etc. The microphone reproduces speech with CD quality fidelity and is intended for use with the Revolabs Executive HD wireless microphone system. With its internal lithium rechargeable battery, there are no batteries to change. Eight hours of operation is achieved on a single 2 hour charge. Box Dimensions (LxWxH) 8.9 x 6.6 x 3.6"